Paper Moon (1973) was Tatum O’Neal’s first film and she walked away with the Oscar for Best Actress in a Supporting Role. She was 10 years old, which is still the record for the youngest Oscar-winning actor or actress. And while she’s terrific the entire film, her line, “I want my $200!” (see the scene below) was her “Show me the money!”-like line from Jerry Maguire. Never underestimate the power and resonance of one emotional line on an audience. Paper Moon was the third Hollywood studio film directed by Peter Bogdanovich and his third successful film in a row following The Last Picture show and What’s Up, Doc? To have a streak of three critical and financial successes out of the gate was an amazing feat, but as we’ll see in tomorrow’s post, it would not last. Bogdanovich’s life after Paper Moon, after he’d reached the mountain top, would become a cautionary tale. As the saying goes, “Success is a poor teacher.” But he’s a survivor and he still has stories to tell—lessons to pass on—which is why when the dust settles I will have written about him for two straight weeks. At the 4:40 mark when Tatum O’Neal’s character says, “Then get it,” the direction Bogdanovich gave her was to say it like John Wayne would. Also, if you notice the up until the 2:00 mark the perspective of the scene is played from the inside looking out and then it shifts to outside (though technically inside the restaurant) looking in breaking the 180 rule. But Bogdanovich covers it “by cutting on movement”—when Ryan O’Neal leans over to get some relish— so the audience doesn’t notice the perspective shift. A trick he said he learned from Howard Hawks. 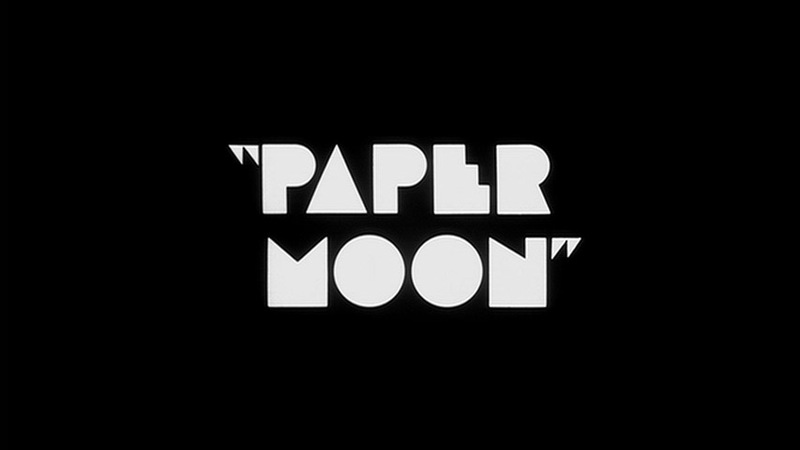 Paper Moon was written by Joe David Brown and Alvin Sargent (based on Sargent’s novel Addie Play). It was Brown’s last film and he died in 1976, Sargent later won two-Oscars (Ordinary People, Julia) and was one of the co-writers on The Amazing Spider-Man (2012). P.S. On the Paper Moon director’s commentary Bogdanovich says that though the novel was a southern story, he thought it would be more interesting to put it somewhere else and remembered how flat Kansas was when he once drove through the Midwest. They shot the movie in and around Hays, Kansas and St. Joseph, Missouri. The opening of the scene above was shot in Gorham, Kansas. (Named after E.D. Gorham once described by the Kansas City Star as “the largest landowner in western Kansas, and perhpas the richest man in that part of the state.” Always comes back to money, right?) The opening title graphics were found in Kansas City by the film’s production designer Polly Platt when scouting locations.